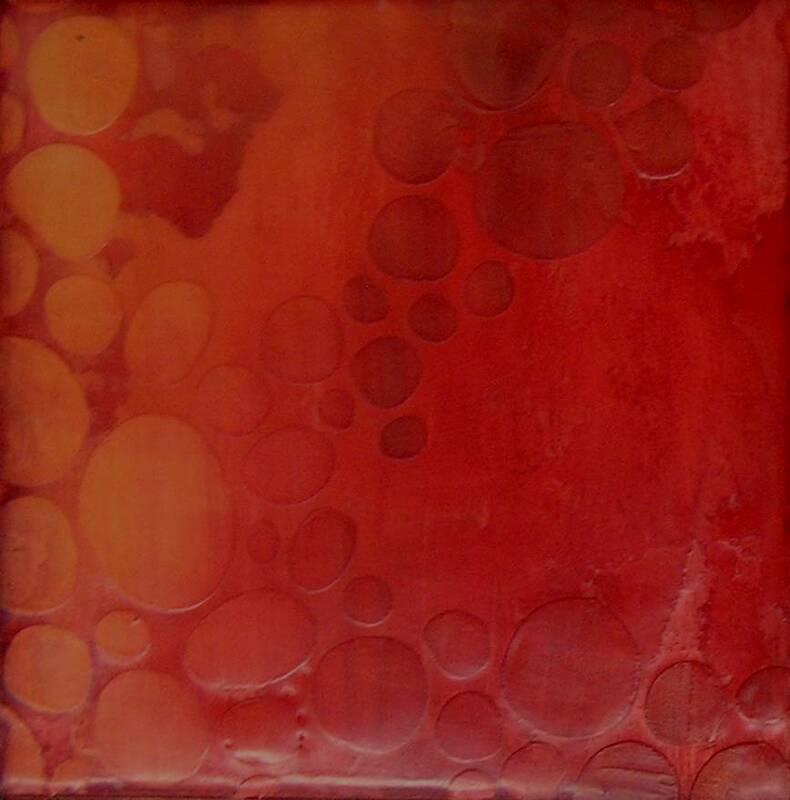 TECHNIQUE: Encaustic – Trish Baldwin | Paint. Draw. Blend. I am an encaustic painter. I have been painting abstractly in this melted beeswax medium for over seven years now; preceded by abstract mixed media. Last year I paid a visit to Toronto Canada at the prompting of a student. In her store/studio she had PanPastel Colors. Their delicious packaging hooked me first, followed quickly by the delight of using them first on paper then on my encaustic paintings. I use PanPastel in many different ways with my encaustic painting. The most deliberate use of them is to ‘blush’ or ‘tint’ the wax as I apply layers of medium (beeswax with damar resin) and color (pigmented medium). This blushing offers a new look to the coloring of the wax in that it is more diffuse and transparent; offering for more layering and depth development than is possible with just the pigmented wax colors. 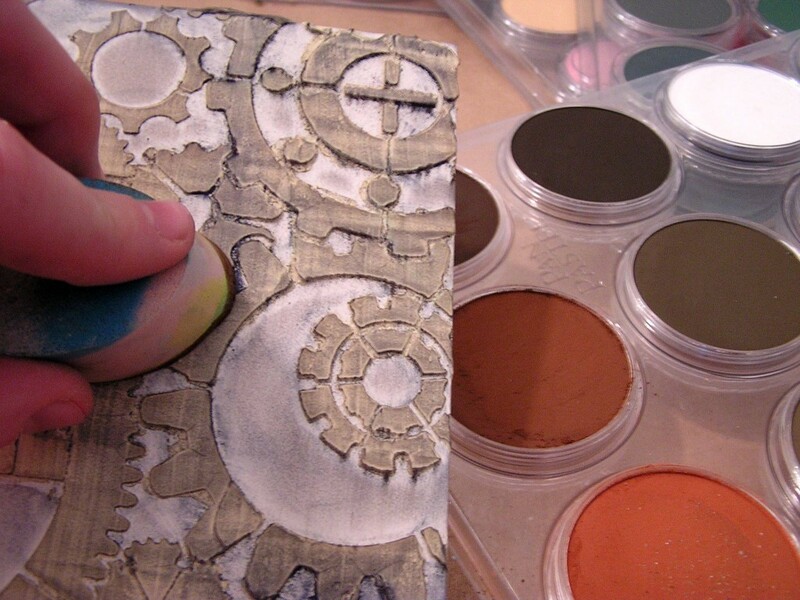 I also love to use stencils and mask off areas, build the wax with these different resists, then tint the different depths of wax created in this method of application with the PanPastel. They also work beautifully on the foundation board before wax has been applied. 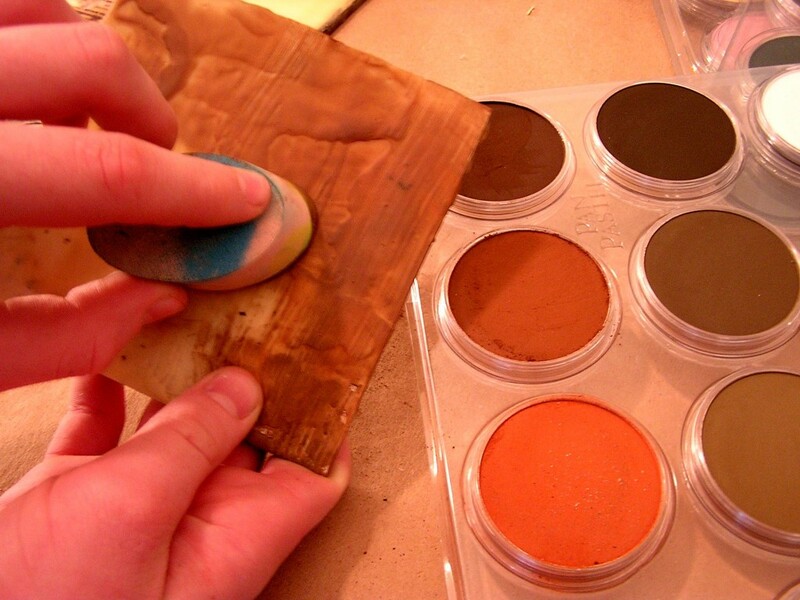 This is a great way to blush an under-painting onto the substrate thereby starting with a tinted foundation, rather than the plain white or wood-tone board. I am doing things very differently now that I’ve had the opportunity to fall in love with PanPastel! I have not worked in such transparent, tinted layers before and PanPastel offers a new option in this technique. I also adore the consistency of the pastels because they allow me fluid, soft blending on the cool encaustic layers that other pastels do not support. To other artists – absolutely give yourself over to this product! It goes above and beyond the range of traditional pastels to offer a whole new realm of use either in and of themselves, or in conjunction with other mediums; as is the case for me with my encaustics. 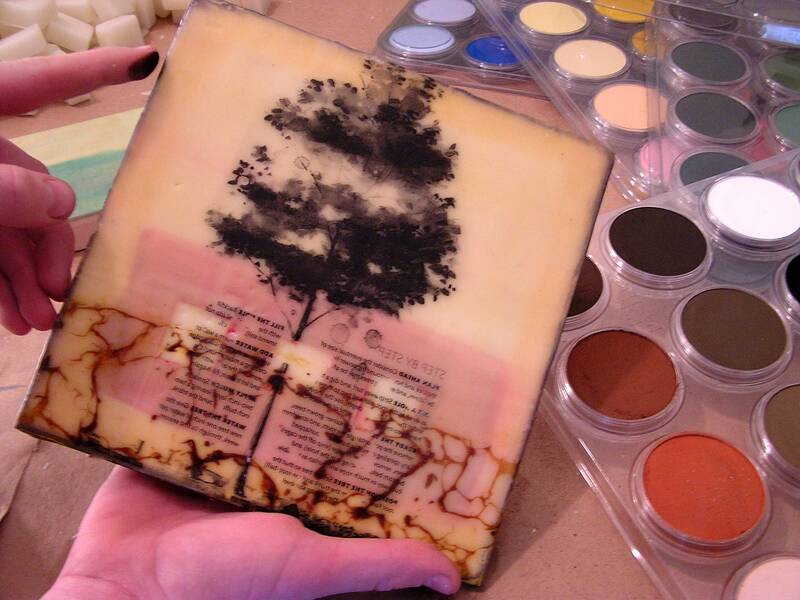 I teach extensively throughout the US and Canada and I am confident in inspiring the students to the beauty and compatibility of PanPastel with Encaustic and enlivening them to the depth and breadth of new possibilities in the marriage of the two mediums. And in my passionate desire to inspire others to try this wonderful medium, I developed “EncaustiCamp”, with its premier opening July 2011 near the Oregon Coast: July 13-17, 2011 www.encausticamp.blogspot.com – an opportunity to indulge in all things encaustic for the experienced as well as new encaustic aficionado. My first book “Encaustic Workshop” is on bookshelves everywhere. 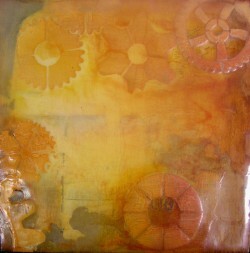 A second book, “Encaustic Extravaganza”, will be available in August 2011. 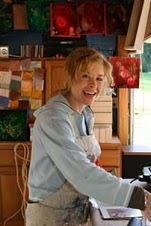 Patricia is self taught; and has been painting in mixed media and encaustic for nine years. Her work has appeared in several gallery shows around central Michigan; her home from 1999-2004, and in Washington, where she now resides. Having the good fortune of working from her own studio on site at her home, Patricia is able to play daily with new ideas that incorporate a variety of mediums into her work. One can find watercolor under encaustic; acrylic as a basis for oil; pastel worked into a watercolor collage. The nature of her work allows for experimentation and interplay of materials without getting caught up in any limitations of medium, style or discipline. While keeping her own work in progress, Patricia also teaches workshops and classes nationally, including at Sitka Center for the Arts in Oregon, ArtFest Port Townsend in Washington, Mendocino Art Center in California as well as through her Encausticamp. She rounds out her life with the raising of her four boys.